Edson Arantes do Nascimento, KBE (born October 23, 1940), nicknamed Pelé, a Brazlilian, is a former football player and thought by many to be the finest player of all time. He was often considered to be the complete footballer, as he was completely two-footed, a prolific finisher, exceptional at dribbling and passing, and was a remarkably good tackler for a forward. Technically outstanding, he also became famed for his lightning speed and his strength on the ball. Over the course of his career, Pelé scored over a thousand goals and won three world cups. Since his full retirement in 1977 he has served as an ambassador for the sport. Edson was born in Três Corações, Minas Gerais, Brazil, the son of Fluminense footballer João Ramos do Nascimento, also known as Dondinho. He was named after American inventor Thomas Edison, and did not receive the nickname "Pelé" until his school days. He originally disliked the nickname, but the more he complained the more he was called by it. Later in life, when reflecting that the world came to know the name, he stated his belief that it was chosen for him by God. Growing up in poverty on the streets of Bauru, he could not afford a football and usually played with either a sock stuffed with papers or a grapefruit. He was given his first leather ball on his sixth birthday by his father's teammate, Sosa. At the age of eleven, Pelé was scouted by Brazilian legend Waldemar de Brito and was invited to join de Brito's amateur team, Clube Atlético Bauru. In 1956, Pele's mentor took him to the city of São Paulo, to try out for professional club Santos. De Brito told the directors at Santos that the fifteen year old would be "the greatest football player in the world". Pelé was offered professional terms and scored four goals in his first league game. 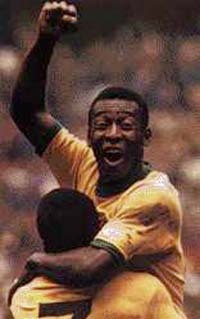 When the new season started, Pelé was given a starting place in the first team and, at the age of just sixteen, became the top scorer in the league. Just ten months after signing professionally, the teenager was called up to the Brazilian national team. In 1958, Pelé became the youngest ever World Cup winner in Sweden at 17, scoring two goals in the final as Brazil crushed Sweden 5-2 in Stockholm. He played in three more Brazilian world cup teams in 1962, 1966 and 1970, two of which Brazil won (1962 and 1970). Although his contributions were limited in the 1962 and 1966 campaigns because of injuries inflicted by the dirty play of opposition players, the 1970 tournament in Mexico was to be Pelé's last. The 1970 team, featuring famous players like Rivelino, Jairzinho, and Tostão, is often considered to be the greatest team ever. Brazil defeated Italy 4-1 in the final, with Pelé scoring one and gloriously setting up Jairzinho for another in what some still consider to be the finest ever world cup. Pelé's sublime technique and deft touch combined with his phenomenal dribbling skills and incredible scoring ability cannot be overstated. His immense haul of over twelve hundred career goals in all competitions has not even come close to being matched by any other man in the history of the professional game. His unrivalled talent in by far the world's most popular sport has led many to consider him to have been the finest sportsman in the history of the world. After his retirement from Brazilian football on October 3, 1974, he joined the New York Cosmos of the North American Soccer League. He played his last game as a professional on October 1, 1977 in front of a capacity crowd at Giants Stadium against his old club, Santos; he played the first half with the Cosmos and the second half with Santos. The exhibition game was sold out six weeks beforehand. He also played in a friendly match with the Lebanese club Nejmeh in 1974 (see Football in Lebanon). In 1995, President Cardoso appointed Pelé to the position of Minister of Sports. Pelé is a long-standing contributor for children's rights at UNICEF and acts as the figurehead of a charity for erectile dysfunction. Pelé is certainly one of the most famous men in football, with his nickname being recognized even by those unfamiliar with the sport. In 2005, Pelé drew international media attention due to the imprisonment of Edson Cholbi Nascimento, his son, who was arrested in an operation to dismantle a drug gang in southeastern Brazil. Nascimento, 35, was arrested along with some 50 other people after an eight-month investigation into a cocaine trafficking operation in the port city of Santos. Pelé is in third place in the list of all-time top goalscorers in World Cup play, with 12 goals, and he is the only player who won three World Cups with his team. He ended his career with a total of 1281 goals in 1363 matches, becoming the highest goalscorer in professional football ever. In his 92 appearances for the Brazilian team, he scored 77 goals. He was awarded Brazil's Gold Medal for outstanding services to the sport, before becoming Sports Minister in 1994. In 1997, he was given an honorary British knighthood. In 1992, Pelé was appointed a United Nations Ambassador for Ecology and the Environment. In 1995, he was appointed an Ambassador for UNESCO at the Goodwill Games. He was voted athlete of the century by the International Olympic Committee (IOC) in 1999. In December 2000, Pelé was named Footballer of the Century by a "Family of Football" committee appointed by FIFA, after a web poll favored Diego Maradona. (For details of the controversial process, see Sports Illustrated Article). In the same year, Pelé received the Laureus World Sports Awards Lifetime Achievement Award from South African President Nelson Mandela. Pelé is a UNESCO Goodwill Ambassador. In 1970, the two factions involved in a civil war in Nigeria agreed for a 48-hour ceasefire so they could watch Pelé play an exhibition game in Lagos. Pelé is the first sports figure featured on a video game with the Atari 2600 game Pelé's Soccer. After winning his second World Cup in 1962, wealthy European clubs offered massive fees to sign the young player, but the government of Brazil declared Pelé an official national treasure to prevent him from being transferred out of the country. Pelé was one of the first black people to be featured on the cover of Life Magazine. Pelé has published several best-selling autobiographies, starred in documentary and semi-documentary films and composed various musical pieces, including the entire soundtrack for the film 'Pelé' in 1977. Tarcisio Burgnich, the famous Italian defender who marked Pelé in the 1970 World Cup Finals: "I told myself before the game, 'he's made of skin and bones just like everyone else' - but I was wrong".